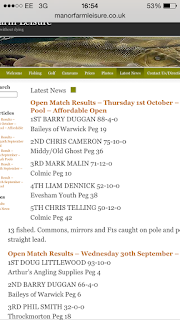 Manor farm leisure open - Boundary Pool - Thursday 1'st October. 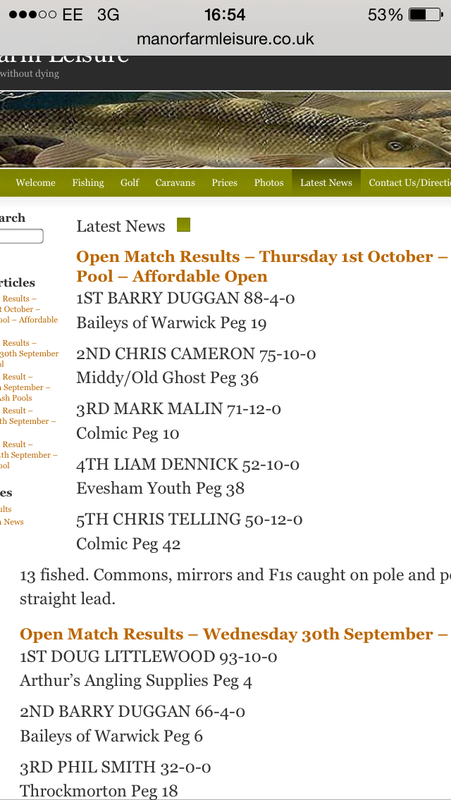 Not very often but today I booked the day off work to fish the open at Manor Farm. Had been looking forward to it all week. At the draw I saw myself heading towards peg 38. Love this peg! The last 3 matches I've fished on here I've been lucky enough to draw this peg twice! Its an out and out pole peg so set my stall out on mainly fishing the pole. 13m Pellet line - 0.4 float to 0.15 - 0.11. 18 B911. 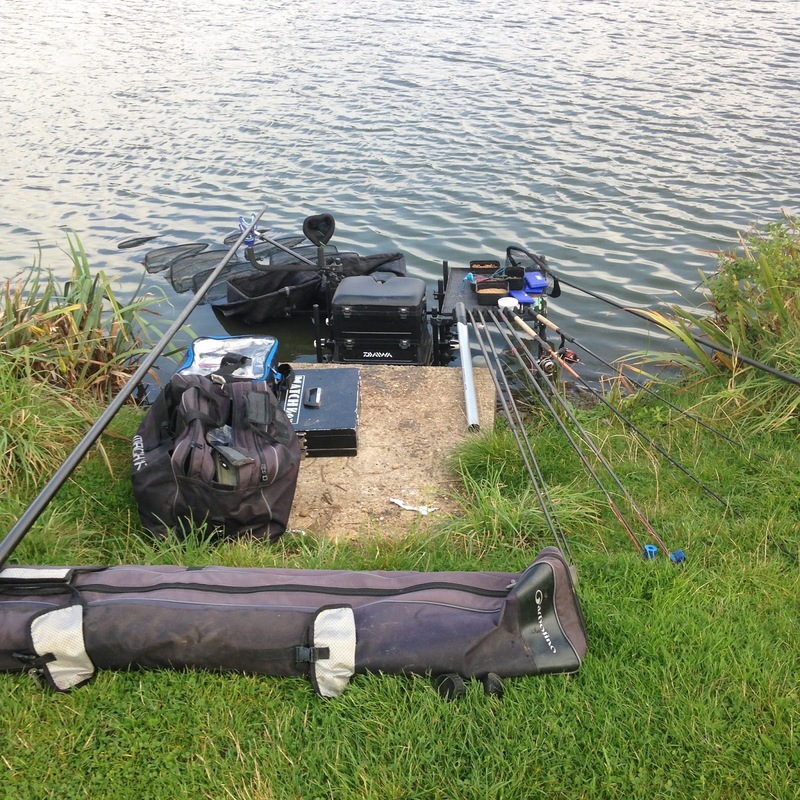 Identical rig but with a spade hook for fishing expander pellets in case it got hard. A bomb, for if I really needed it. I really set my mind on staying on the pole and hopefully catching on it most of the day. At the all in I fed 40 pellets through a big pot and then shipped out my rig with 10 pellets in the cad pot and lowered in my rig. Had 2 early F1s within the first five minutes and then couldn't get a bite. As the day progressed starting pinging on the pole and in the first few hours only had a few fish so picked up my bomb rod and sat on that for an hour and a half and by 2;30 I had about 7 F1s and was off the pace. I decided to big 3/4 of a pot of pellets in at 13m and go straight on it, this was a good idea as after 5 minutes of lifting and dropping the float slid under and I was attached to an angry rather large common! weighing around 8lb. After that I went back in and foul hooked an F1 so got me thinking. I increased the pinging of pellets and decided to fish shallow. By now we only had 45 minutes left so It was a brave decision. But the right one! After 15 minutes of working hard, slapping, feeding, repeat I had my first fish and from then on I caught really well till the end. On the clicker I had 16 fish. 14 F1s and 2 carp. I weighed in 52-0-0. This put me 4th out of the 13 that fished. Round up: I felt my match could of gone better and if the wind would of stopped earlier I could of fished shallow earlier on in the day. Really enjoyed the day as always and learnt a lot.